New NBA season and new team-mates, but it was the same old Russell Westbrook for the Oklahoma City Thunder. 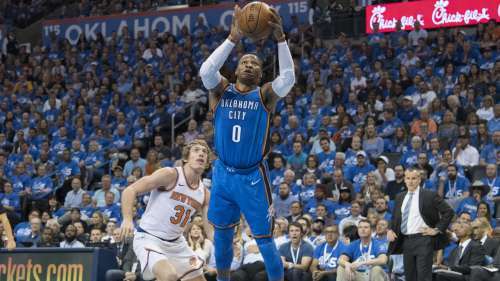 The reigning MVP picked up where he left off last season, recording a triple-double in the new-look Thunder's first game of the campaign, a 105-84 win over the New York Knicks on Thursday. With 21 points, 16 assists and 10 rebounds, Westbrook joins Oscar Robertson as the only players in NBA history with 20-plus points, 15 or more assists and 10-plus rebounds in his team's season opener. But unlike last season, it is not all about Westbrook anymore. Melo & Paul George help lead the @okcthunder to their first win of the season! All-Star additions Paul George and Carmelo Anthony also starred in the blowout win at Chesapeake Energy Arena. George led the Thunder with 28 points while Anthony added 22 against his former team. The Toronto Raptors and Los Angeles Clippers joined the Thunder in the win column on Thursday's small slate. Toronto topped the hapless Chicago Bulls 117-100 while the Clippers won the battle for Los Angeles 108-92 to spoil Lonzo Ball's Lakers debut. Kristaps Porzingis scored 31 points with 12 rebounds for New York but Enes Kanter (10 points) was the only other Knicks player in double-figures. Toronto big man Jonas Valanciunas had 23 points and 15 rebounds in the Raptors' win over the Bulls, while new team-mate C.J. Miles added 22 points. Clippers big men Blake Griffin and DeAndre Jordan put up impressive point-and-rebound totals in a win over the Lakers. Griffin finished with 29 and 12 while Jordan grabbed 24 rebounds to go with 14 points. Ball struggled in his Lakers debut, scoring just three points on one-of-six shooting against the Clippers. Ball, who missed time in the preseason with an ankle injury, registered a minus-14 and had just four assists. Blake Griffin posterized Julius Randle in the first quarter of the battle for Los Angeles. B L A K E.
Boston looks for their first win without Gordon Hayward while Joel Embiid and Ben Simmons may take advantage of the Celtics' lack of depth.